Last week I was working on a larger 20 x 16 inch painting and it is almost done, so soon I will be able to photograph it and share it with you. Well the next day was a bright and sunny day, and I realized that I had botched a lot because of how dark the previous day had been. However, this turned out to be a gift in disguise, because I was able to add more layers of paint, some places were painted wet into wet, and other areas had paint scumbled across the top of previous layers of paint. 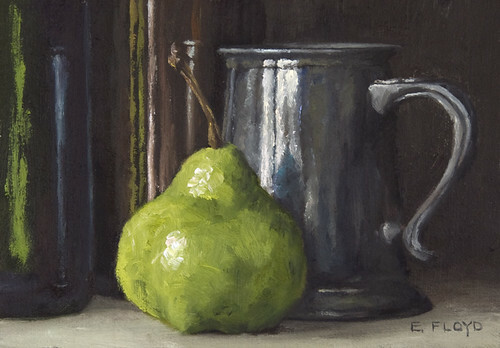 So all these days working on this little painting afforded the time to effectively capture the weathered appearance of the old Phillips Digestive Cocoa wooden box that the pear was sitting on. And here is a photo of miss N. in a new hat. Thank you Marie and Lily for the beautiful gift! I am a little behind on posting these paintings. It seems like I am late in getting a lot done lately... the run up to Labor Day weekend always is full of loose ends and this summer is no different. Happy Friday! This weekend is the long awaited 20th Year High School Reunion for S. I am really looking forward to meeting so many of his former high school friends, and I anticipate the weekend will be busy. And going into the weekend I received great news from the Catharine Lorillard Wolfe Art Club that the painting above was accepted into the 114th Annual Open Juried Exhibition that will take place in October in New York City! I had shown a work in progress image previously however I never got around to sharing the completed painting with you. PS. Slim has been helping me write this blog post, really she has been hindering me as she insists on sitting on my arms. Yesterday was the two year anniversary of this blog! Thanks for being a part of this journey and I hope you continue to visit and share your thoughts! For this painting I applied some of the painting techniques learned in the Danni Dawson Workshop. I spent about twice the typical time on this painting than is usually spent on these paintings, though it was a good learning experience and rewarding. I use RayMar canvas panels, and this is on the smooth cotton canvas. I like how the smooth canvas texture can be used or obliterated depending how thickly the paint is applied. Tomorrow I am traveling to Texas to visit my grandmother for a week, while away I will not have regular access to the internet and I am not taking my painting kit with me. Last time I traveled it turned out to be just a heavy item in my luggage that only saw the light of day once. So for this trip I will just take my camera and take photos for future paintings when I get home. A few weeks ago I was reading about sharp and soft edges in paintings in my favorite book right now, Harold Speed’s The Practice and Science of Drawing . Within days of reading about this topic I visited the Titian, Tintoretto, and Vernese exhibit at the Boston Museum of Fine Arts, and saw Titian's Venus Anadyomene, where the entire horizon was entirely diffused though it did not take away from the perceiving the edge of the sea to the sky. With this painting I specifically chose to investigate the affect of diffused edges, painting a larger proportion of soft edges and deciding on only a few areas of specifically sharp and defined edges. I wanted to see if this would help create a greater sense of atmosphere and depth, I will play with this idea for a while to see where else soft diffused edges can strengthen a composition. Here is the last pear of this series, and it was completed predominately with round brushes. This week of actively trying new painting techniques and working through the process has been good, in that I think I am starting to get the swing of using the rounds. There were times during this series when I wanted to go back to my comfort zone and pick up a bristle filbert paint brush (on Tuesday I did just that). Though by setting the parameters with each daily painting a new comfort level has been achieved and that was the goal. This week I have been reading on Heather Smith Jones’ blog about her thoughts on creativity here and here. These two posts have been meaningful for me as I am personally working on how to balance all the art projects floating around in my head and the constraints life sometimes imposes. Since Sunday I have been working on a 16 x 20 inch painting and this daily painting series. They have consumed my days, standing at the easel for long periods of time and when taking breaks still thinking about them. On a mental level this week has been wonderful however it has overworked my back. Where my existing back injury has flared up and yesterday I had to see my physical therapist. She encouraged me to slow down. Bittersweet advice as I really want to paint. Tomorrow I am planning to find other ways to be creative and help soothe the back injury so next week will not be hindered with sciatic pain. It was Heather’s posts that reminded me that creativity comes in ebbs and flows and it is okay for the experiences to not be what you expected. How some areas feed others. I am curious, how have you found balance in your life and creativity? How is the weather where you’re at? Here in DC it has been gray skies and rain since Monday. It is starting to get me down some. It is great for the trees and plants, but it is hard to be motivated to go outside. Today’s painting was completed again with the synthetic rounds I have been experimenting with this time using larger sizes than on Monday’s painting. Today I used mainly a size 5 and sometimes a size 3, where previously I worked with sizes 0 &1. When I was painting on Monday I began to wonder if the size of the brush also affected the “stiffness” of the brush, which then in turn influences how paint is laid down on top of previous layers. Well with this brand it does make a big difference! I was really surprised and because the tip is quite fine, laying down small details is still possible when using a size 5. I have always admired the classical still life paintings that have a dark burnt umber background. So today playing with a variant of a dark background I used burnt umber instead of a black background. Work by Francisco de Zurbarán and Pieter Claesz come to mind as being particularly inspiring when thinking of still lifes with dark backgrounds. Last weekend I decided to start experimenting more with oil mediums. This painting was painted almost entirely with the aid of Liquin. Most of the time when I paint, it is with the paint straight from the tube. I like the thickness of the paint and the quality of brushstrokes you achieve with using paint this way. However I am trying to branch out and try different methods. So using medium seemed like the correct next step. I choose to use liquin because supposedly it makes oil paint dry faster; I am still not sure about that. Getting paint to dry faster has been an issue since I have been using titanium white more often and it takes forever to dry and setup versus cremnitz white, which is my white of choice. Yesterday I spent most of my time fine tuning and working on the wood grain of the crate. All an exercise in patience and observation. Sunday mornings begin with me heading over to the Mount Vernon Rec Center to swim. My friend, Marilze, encouraged me to start swimming again on New Years Day. After a morning swim I am usually ready to dig in and focus on the day’s tasks, which always includes some time to paint or draw. 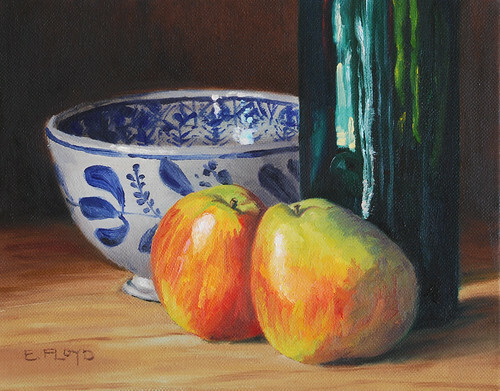 For this painting along with the prior apple painting I set up the lighting for a dramatic effect. I propped up a panel to half block the directional light to cast a long shadow in the background on the side the light is positioned. This method really enables some dramatic contrasts in light and dark. Something I will continue to play with. This was my final painting of the forelle pears, as they were starting to over ripen under the spot light some. For this painting I tried to paint quickly and with more energy. I used the experience of the two previous paintings to inform my decisions and to experiment with color and paint application. I did not blend as much as previously and laid paint down a little heavier than I have lately done. I am really pleased with how this painting came about, especially the rich blues/purples of the shadow area of the red portion of the forelle pear on the left. 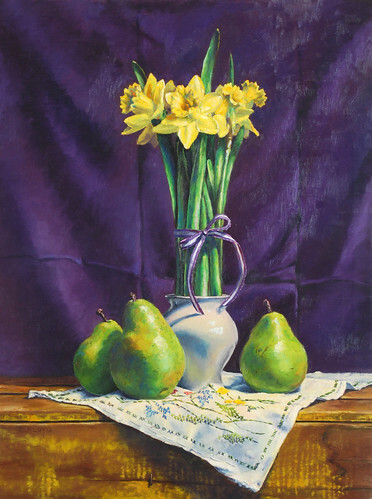 I enjoyed painting the first set of forelle pears so much that I switched out one pear and painted the same scene. All during the fall term in my painting class I worked on developing my ability to paint wet into wet and to also create more refined brushstrokes. It was really a good experience, but I believe I prefer having the brushstrokes seen. Painting in a more controlled manner has its benefits and I will definitely keep this technique in my arsenal, however when I am just painting for myself and not in class, I think I will leave the brushstrokes alone and not soften them. These are forelle pears, to me the most beautiful of pears out there. Recently, I have been inspired by photos of forelles. Here is a link to a blog post on the Frolic blog that have some forelles as part of a centerpiece, I love this photo. This pear would to stand up, so I gave up and painted it on its side. Yah-hoo! I was able to grab some time yesterday to make a small painting! It feels like it has been forever… for the past four weeks my painting time was cut in half with work and other business related activities. It feels good to be back in the saddle. This was my second attempt at painting this single pear. The first one got wiped down. And it really proves that you have to go with your gut on this, as the first attempt was just not coming together. When I did wipe it down, I felt free and ready to face the next opportunity. For me this pear was a challenge to depict the blues and purples in the shadow areas while also making the form round.